Dixie Stampede is one of the most popular attractions in Branson where you can watch a variety of exciting shows mixed with an awesome dinner. The Dixie Stampede Dinner and Show is a childhood dream come true of Dolly Parton that became a favorite place for locals and visitors to watch great entertainment shows. The captivating production shows of a variety of performers in Dixie Stampede Dinner and Show are something very unique and memorable for all guests where north and south compete in many entertaining contests that everyone loves. The Dixie Stampede in a 35,000 square foot theater was based on Dolly Parton’s remembrance of friendly rivalry of contestants. This wonderful show at Dixie Stampede features live animals, dramatic sounds and lights, and pyrotechnics. Talented women and stuntmen in the show perform incredible tricks on horseback. The beautiful combination of musical productions and special effects creates one-of-a-kind experience that will give you a long lasting memory. The ticket you will get for the Dixie Stampede Dinner and Show includes a sumptuous four-course meal delivered right to your seat while you watch the exciting performances of all talented entertainers. The dinner feast you will enjoy at Dixie Stampede Show includes a whole rotisserie chicken, barbecued pork loin, vegetable soup, corn on the cob, a herb basted potato, and a homemade biscuit and delectable desserts. You can request for a vegetarian meal which include vegetable soup, garden vegetable salad, a herb basted potato, and corn on the cob. In addition to the entertainment show and a delicious four-course meal, your ticket gives you access to the Carriage Room pre-show. At the Carriage Room, you can have the opportunity to walk through the stables to see Palomino, Quarter Horse, Paint, and Appaloosa horse breeds. The Dixie Stampede Belles will guide you through the room where you will have family fun and comedy from Mountain Rukus. During the pre-show, peanuts and soft drinks are served in the Carriage Room. Also available inside the room are non-alcoholic drinks that are served in Dixie Stampede’s Souvenir Boot Mugs. The Dixie Stampede Show features a rival duel that goes high into the treetops with the “Rumble in the Treetops’’ competition of lumberjacks. Lumberjack teams who are all skilled as they chop, saw, climb, and roll the log through a four-event relay show all their strength and agility during the competition. The competition is between the Northerners and the Southerners. This entertaining event at Dixie Stampede is featured by 32 magnificent horses, trick riding, a stampede of buffalo, and music and comedy. 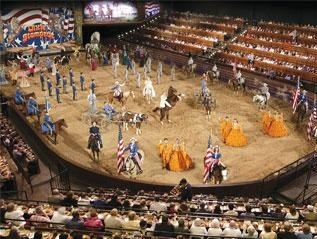 This exciting event at Dixie Stampede is a wonderful country attraction that nothing can compare. The finale act in this exciting Dinner Show is performed with American songs written by Dolly Parton which features dazzling and lustrous costumes that assure all guests to enjoy utmost fun and excitement. So, if you want to experience a great entertainment show combined with delicious four-course meal, watch the Dixie Stampede Dinner and Show in Branson.